It's been a while hasn't it? 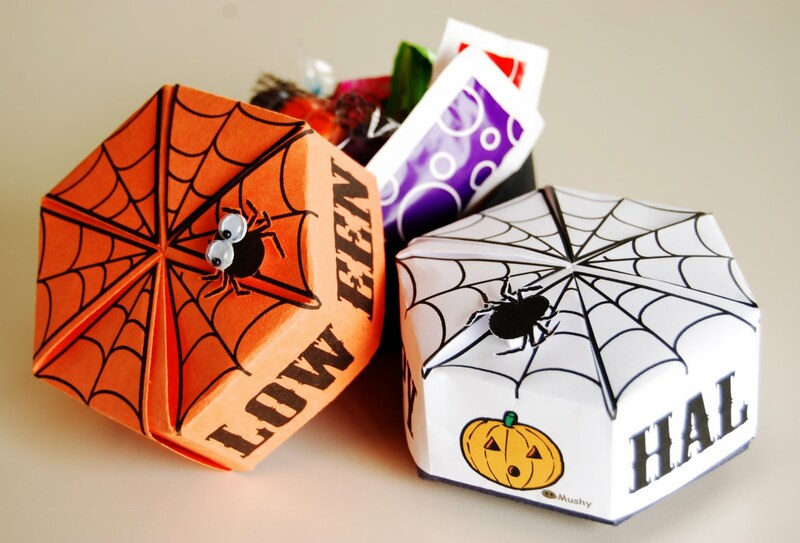 So just in time for Halloween, printable spider origami boxes for treats or tricks. If you know how to fill tricks in there, let me know! There is some crazy origami folding involved, but you'll get the hang of it after one or two attempts. If you can fold, you can do this. Use letter size (8½"x11") white or colored paper. Construction paper or light card stock works well too. Just something not too stiff because you need to do a lot of folding. Print the box top sheet from here and the box bottom sheet from here. *You don't really need to print the bottom sheet really. Just cut two rectangles 6½"x 5¼"(16.5cm x 13.3cm). and cut the bottom box rectangle sheets either from the print out or without(see * above). With one of the top box rectangle sheet, have it face towards you upside down as shown in the photo. Flip the sheet over and make sure the print is still upside down. Unfold and you get three vertical lines as shown in the above photo. Fold the top edge down horizontally to meet up with the bottom right corner. Fold the top again horizontally along where the top edge and the corner meet. Unfold everything. "Say what?" I know... just do it. 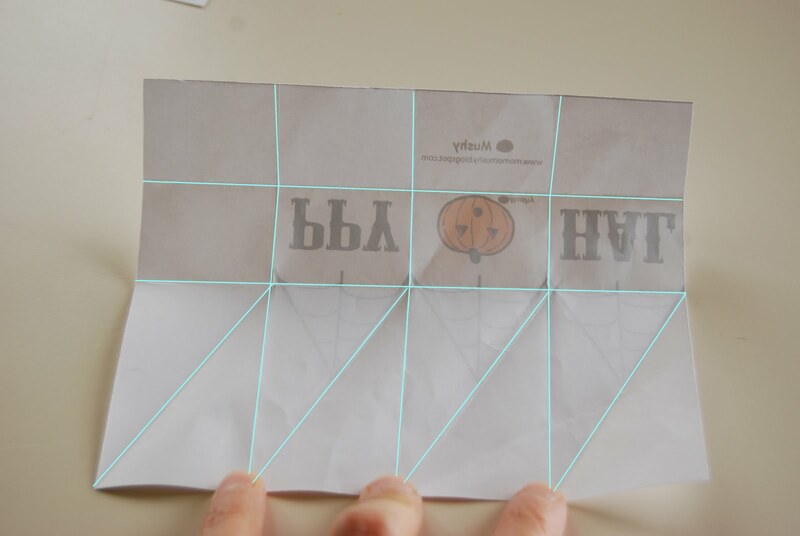 Now fold a line from the bottom of the third vertical line to the top folded line corner. Now do the same with the middle vertical line bottom to the corner where the third vertical line and top line meets. Again same thing, first vertical line bottom to the corner where the middle vertical line and top line meets. And fold along the bottom left corner to the corner where the first vertical line and top line meets. So your sheet should have these folded creased lines which we will use for our final folds. Fold the top down once. Fold the bottom right corner fold. Fold the third vertical line up as you are folding the next diagonal line in. Repeat with folds of the next vertical line and diagonal line. And finally fold the last vertical and diagonal lines..
Repeat all the same origami folding steps with the other top rectangle sheet. When you have both sheets folded, you are ready to assemble the top of the box. Slide the two pieces together like so. At the top, slide the right edge under the left. In the bottom the left edge should slide under the right. After a few shoving and adjustment here and there it should look like this. Turn it over and you have the top of the box. Repeat all the exact same steps, folding, and combining with the two bottom rectangular sheets. Cut out that little printed spider. Glue it on top of the box. I used these styrofoam 3D dots to make it stand out. I think those plastic spiders would be fun too. Add some googly eyes or other ghouly decorations. Place the top over the bottom. Don't forget to fill it with your favorite Halloween treats. Wow, those are super cute and your directions are fabulous. I feel like I could totally do this! Thanks so much, I'll be linking. Thank you so much for this post. I want to let you know that I posted a link to your blog in CBH Digital Scrapbooking Freebies, under the Page 1 post on Dec. 03, 2010. Thanks again. Great tutorial! with very helpful pictures. On my 2nd & 3rd boxes I made all mountain folds on the bottom vertical lines and then it almost folded itself. Thanks so very much. Love this box. I made about twenty. Then, I realized if I made one out of orange paper, it looks like a pumpkin (when you all a stem to the top). It also would be cute for a birthday with a candle on top. Any chance of designing one for birthdays? I don't have the skills to do so. It wd be nice to have a go-to little birthday gift. Thanks for sharing your talents. I'd love to make this but I can't find a link for the print out....am I completely missing it?